There are two types of Imperial Legion Soldiers - riders and guards. Riders will patrol back and forth between two locations. They are always found along the main roads in Cyrodiil. They ride bay horses, but never at more than a walk. Guards are posted at specific locations, usually inns outside the major cities. (The cities have their own guards.) They are all Imperial men. 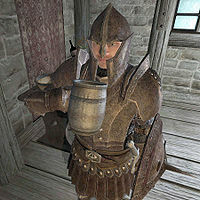 They never eat or sleep, though the guards can occasionally be seen drinking in their respective taverns. They will jump into action at any sign of trouble. (Riders have been known to dismount and chase creatures for miles, leaving their horse by the side of the road for days while they track it down.) They can be killed, but will respawn after 3 days. Two Imperial Legion Soldiers (and one archer) will follow you from the Chapel of Akatosh during The Battle for Castle Kvatch. Several of them will also follow you during Light the Dragonfires. Imperial Legion Riders will sometimes get off their horses and "float". 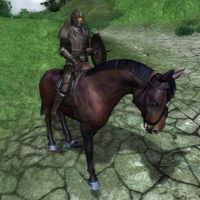 If an Imperial Legion Rider is chasing you for a crime while on horseback and he dies while he is still on the horse, the camera will zoom in into a spot on the ground and the guard dialog will begin. If you resist arrest, you will be attacked by an invisible "ghost" guard. You can fight back against the invisible figure or you can walk over to where the guard died and attack his body to kill him (the body is still twitching as if he is alive). Detect life cannot be used to locate the invisible "ghost" guard, the glow will merely appear on the fallen guard's body. Sometimes the player can encounter Imperial Legion Riders stuck in a gallop stance. Both the horse and rider will merely fixate a few feet above ground. To resume the guards activity the player should either reload from the last save point or attack the rider who will then unfreeze and attempt to arrest you. ? Esta página foi modificada pela última vez à(s) 07h21min de 20 de janeiro de 2015.